Last edited by Chief F1 Fan; 11-18-2018 at 07:23 AM. Scary. Glad that she is relatively okay. This is the type of crash that the Halo would have helped, yet F3 doesn't have the Halo. Which goes to show the uselessness of the Halo. I couldn't believe it when I saw the footage. Crazy. I totally thought she was dead. I was mortified. So thankful none of the 5 people that were sent to the hospital perished. Nuts. Saw this posted on another forum, where most of the comments are criticizing that fact that a 17 yr old was driving a race car at those speeds, despite the fact that these kids start racing at 4-6yrs old & are far more qualified & experienced than most that were commenting on it. Glad she survived what looked like a horrific crash. Seems a lot of the YouTube crash videos involving motorsport always have a few clips from Macau. Such a tight circuit. Was it brake failure cause it looked like the car never even tried to slow down at all? Thank goodness her injury were't worst, that looked horrific. What saved her was the structure her car hit deformed greatly and absorbed the energy and had far lower deceleration than a more solid structure. One of the angles above/behind the structure she hit, shows it move what looks like a couple feet. Hopefully she mends up well. No, apparently she didn't slow in time for a car she was following when a yellow flag came out, she hit that car, tore off her right front suspension, hit another car which launched her in to the air as she had no brakes. Damn. Makes sense though. Basically launched at full speed. Lucky to be alive. As she continues to recover from her high-speed Macau Formula 3 accident last month, Sophia Flörsch firms up her racing plans for next season. Sophia Flörsch has confirmed her plans to return to Formula 3 in 2019 once her recovery from her Macau Grand Prix crash is complete. Flörsch, 18, sustained a spinal fracture in a high-speed accident at the Macau Formula 3 finale last month that left her requiring surgery, but she has since returned home and is confirmed to have “no fear of paralysis." 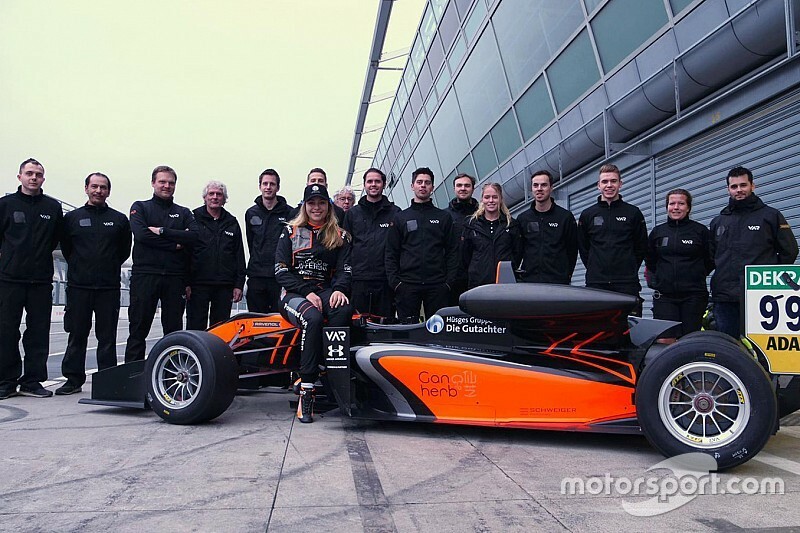 Flörsch raced in the FIA European Formula 3 Championship through 2018, and will remain in the category – renamed Formula European Masters – for 2019 once her recovery is complete. “I am convinced that the Formula European Masters is the perfect race series for me,” Flörsch said. “The car is fantastic. It offers young drivers the opportunity to learn a lot. This is demonstrated by history. After all, countless racing drivers learned their trade in these cars and their predecessors to make it to the top categories of motor racing, afterwards. And the DTM environment is fantastic! Flörsch is aiming to get back behind the wheel of an F1 car in the early part of 2019. “When I watched the video of my accident for the first time it felt somewhat surreal. I know that I was lucky and am thankful that the Dallara is such a safe car,” Flörsch said. “I already may begin with gentle training and hope that I will be able to get into the cockpit of my racing car, in spring. “Despite having joined the 2018 season late she did a really good job,” said Van Amersfoort Racing team boss Frits van Amersfoort. “Nonetheless, there still are things she can learn in the Formula European Masters. But she also will make use of her experience to regularly try to battle it out for top-10 positions. “We are delighted that Sophia will keep on racing for us as she’s a real asset to our team with her motivation. “As soon as she has fully recovered, we will have a car ready for her." The 18-year-old German has been taking part in a two-day test at Monza with Van Amersfoort Racing as she prepares for the Formula European Masters series, which uses the cars from the discontinued FIA European F3 Championship. Floersch completed over 90 laps of the Italian Grand Prix circuit on Wednesday in good weather conditions, setting a best laptime of 1m44.548s to top the leaderboard, albeit mostly against F4 and Formula Regional-spec machinery. The test has continued into Thursday, but conditions have turned wet. Floersch, who sustained a spinal fracture in the Macau shunt, had previously been on the simulator at VAR’s workshop before hitting the track at Monza this week. Team boss Frits van Amersfoort said Floersch has shown absolutely no ill-effects from the injuries during the Monza test. “She’s extremely fit,” van Amersfoort told Motorsport.com. “We’re the only F3 cars here so we can’t really compare times. “But put it this way: I think she looks stronger than she did in the whole of last year; we’re quite satisfied with what she’s doing. “It’s starting to feel a little bit like Mick Schumacher [who the team ran in German Formula 4 in 2015] – we had over 20 photographers hanging over our pit box yesterday! Floersch has been joined in the VAR line-up at the Monza test by ex-BRDC Formula 3 and Formula Renault Eurocup racer Callan O'Keeffe. The 22-year-old South African, a former Red Bull and Lotus F1 Junior, has not raced since 2017 but is hoping for a comeback in Formula European Masters. “I’m quite impressed by [O'Keeffe],” said van Amersfoort. “He’s still a little bit rusty after a long time out, but he’s extremely motivated and he has worked quite well in the gym. The team is also in discussions with Petru Florescu, who contested several rounds of the 2018 Euro F3 series with Fortec Motorsport. That is awesome she is back racing after such a horrible crash.